In the late 1960s, baby boomers came of age and wrestled with the status quo. They protested injustice, rallied for peace, and sought enlightenment. Yet here we are 50 years later, and exhausting conflicts and tough questions remain. Do gurus and mystics offer real answers? Aren't all religions basically the same? Can we truly find hope in violent times? 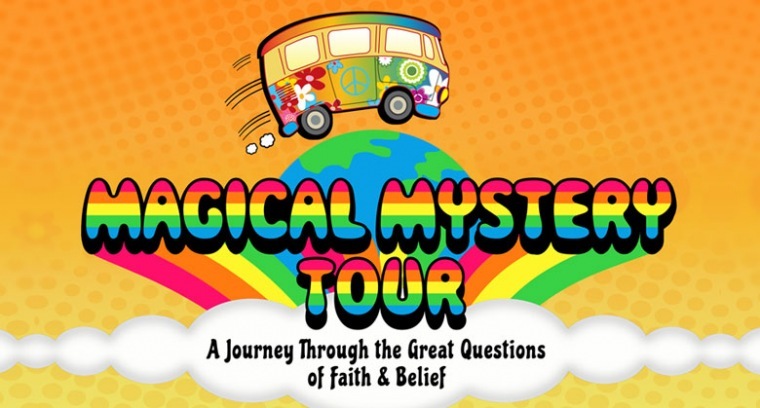 Join Horizon for MAGICAL MYSTERY TOUR as we journey through the great questions of faith and belief. Evil: Who'll Stop the Rain? Human Dignity: What's Going On? The Bible: Who Are You? Temptation: Sympathy for the Devil? Christ: Jesus Is Just Alright? Tolerance: Put a Little Love in Your Heart?